Not so long ago, any mention of nuclear reactors in the mainstream news would have involved reports of fires, mishaps, construction defects, nuclear fuel storage nightmares, or hints of deadly catastrophe lurking in the shadows. Suddenly, nuclear reactors -- particularly small, modular nuclear reactors -- are worth talking about again, and in a positve way. Small reactors could become available in the future at bargain prices of less than $600 million, and they would only take two to three years to build. By comparison, reactors in the gigawatt range cost more than $5 billion, and financing is often a challenge. Some projects, such as the current construction of a new reactor in Olkiluoto, Finland, are years behind schedule and vastly over budget. 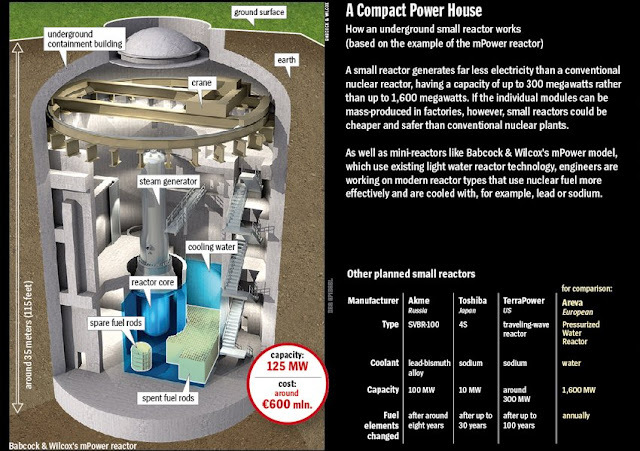 Because they are delivered pre-assembled, mini-reactors could also be used in countries without domestic nuclear experts. The plants produce about as much energy as gas or coal power plants and could therefore simply replace them. Existing power grids and turbines could still be used. The miniature reactors unleash their fissile power from locations deep underground, which would make it difficult for terrorists to steal fissile material. "Small nuclear reactors are cheaper, safer and more flexible," raves Tom Sanders, president of the American Nuclear Society. Sanders wants to mass-produce nuclear power plants, just as Henry Ford did with cars in his time, and make them available around the world, particularly in developing countries. ...Fans of the new miniature reactor world aren't allowing the grumblers to spoil their mood. Instead, they are developing bolder and bolder projects for the future. For example, nuclear scientist Tom Sanders and a team at the Sandia National Laboratory are developing a reactor that would cost only about $250 million at a planned production rate of 50 reactors per year. Liquid sodium cools the uranium core of the plant, which resembles a sort of replaceable cartridge. Of course even in a relatively positive article such as the one above, you will still see the obligatory "environmental expert" moaning about the decades-bred nightmares of nuclear-gone-wrong. This is a German publication, after all. They have to quote the greens, even if greens are professional activists who do not have a problem-solving bone in their entire bodies. There is nothing new in the Spiegel piece, other than the fact that small, modular nukes are now getting mentioned in the mainstream. And as favourable mention in the mainstream continues, public opinion toward safe, new nukes grows more supportive.